Honoulu is the capital of Hawaii and is home to the world famous Waikiki Beach. Hawaii is a US state. When dining in restaurants, it is customary to leave 15-20% tip for good service since servers typically make minimum wage. Taxi drivers should be tipped the same rate. Banks and ATM's can be easily found downtown and in Waikiki. From Aloha Tower, Walmart may offer a free shuttle. Enterprise car rental has a location near the piers at 677 Ala Moana Blvd. Lyft and Uber ride-hailing apps operate in Honolulu. 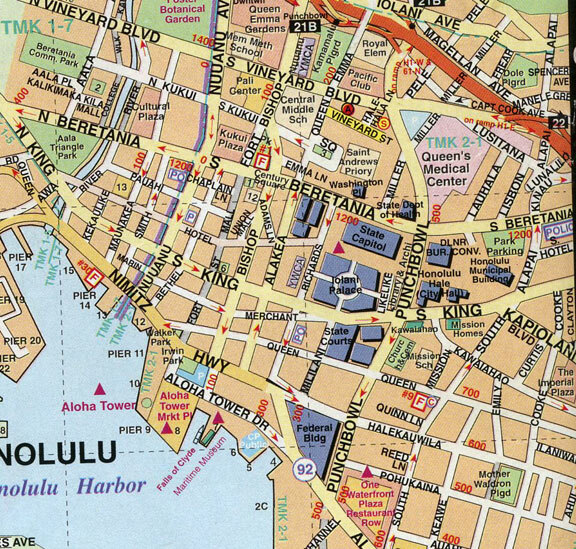 Waikiki - This area is the main tourist zone with hotels, malls, restaurants and Waikiki beach. Direct bus routes are bus 2 or 13 from Hotel and Bishop Street, or 19, 20, or 42 from King and Bishop Street. You can also take buses 55, 56, 57, 65 from Aloha Tower Drive (bus stop located at the next pier to the south and also by Pier 2 on Ala Moana Blvd) and transfer at Ala Moana Beach Park for Waikiki-bound buses. Return on bus 19, or 20 and get off on Alakea Street at Nimitz Highway or bus 2, or 13 and get off on Bishop at Hotel street for Aloha Tower. Alternatively, take any bus heading to Ala Moana and transfer to 19,20,55,56,57 or 65. Ala Moana is the island's largest mall. Nearby to the north is a Walmart and Sam's Club. There is a Japanese food court, Shirokiya Japan Village Walk, here with $1 beers. Take bus 19, 20, 55, 56, or 57 (same stops as going to Waikiki). Hilo Hattie's (famous for their Hawaiian shirts) had financial difficulties in 2015 and closed many stores throughout Hawaii including their flagship store on Nimitz Hwy. They still operate online and have a few stores remaining including one at Ala Moana. You can find macadamia nuts and chocolates at ABC stores (everywhere in Waikiki), Walmart, and Long's drugstores. Aloha Tower Marketplace beside the pier has several restaurants including Hooter's and a Gordon Biersch brew pub. It has been revitalized as a campus with dormitories for Hawaii Pacific University. The downtown area close to the pier has a Ross Dress for Less, Walmart (opened July 2014, old Macy's location, hours 6am to 10pm daily) and Long's drugstore. This area is very quiet and a bit dodgy at night. Walmart is a good option for both souvenirs and groceries. Some big box stores such as Home Depot, Best Buy and Costco can be found off Nimitz Highway west of downtown. Chinatown is right beside downtown to the north. There are two indoor markets: Oahu Market (corner of N King and Kekaulike) and Maunakea Marketplace (1120 Maunakea St) which has a food court as well. For supermarkets, the downtown Walmart is the closest to the pier. There is a Safeway about 10 blocks to the east of the pier along Fort St. You can also get some groceries items at Long's. In Waikiki, there is a Food Pantry supermarket on Kuhio Ave. At Ala Moana, there is a Foodland supermarket and Long's in the mall and Walmart nearby. The old International Market Place in Waikiki with it's stalls set among Banyan trees closed at the end of 2013. It re-opened in Aug 2016 as a modern shopping center with 90 stores and 10 restaurants. The offer a free cultural show every evening. Ward Centers is a complex of five malls with more than 130 stores, 40 restaurants, movie theaters and a Saturday morning farmer's market. Located west of Ala Moana mall. Duke's Waikiki - right on the beach. 2335 Kalakaua Ave, Suite 116. Serves their famous Hula Pie. For chinese food, try Legend Seafood (100 N Beretania St) or Happy Garden (1113 Maunakea St) for dim sum or Little Village Noodle on Smith St (all three in Chinatown). Hong Kong dim sum chain Tim Ho Wan recently opened a restaurant at Royal Hawaiian Center in Waikiki. Helena's Hawaiian Food - A popular local favorite. JJ Dolans is an Irish pub serving NY-style pizza in Chinatown. 1147 Bethel St.
Aloha Tower Marketplace and the Pioneer Plaza food court across the street from Aloha Tower on Fort Street may have free wifi. The Apple store in Ala Moana has free internet. Restaurants and cafes may provide free wifi for customers.